I just wrapped up attending the NCTM Annual Conference in Washington DC. As always, I’m feeling inspired and fulfilled, overflowing with tons of ideas. I could write about the sessions, including my own, for days. But first, I want to talk about the bookends of the trip. I’m going to start with the end. In the few hours between the last session and my flight, I spent some time at the National Museum of African-American History and Culture. 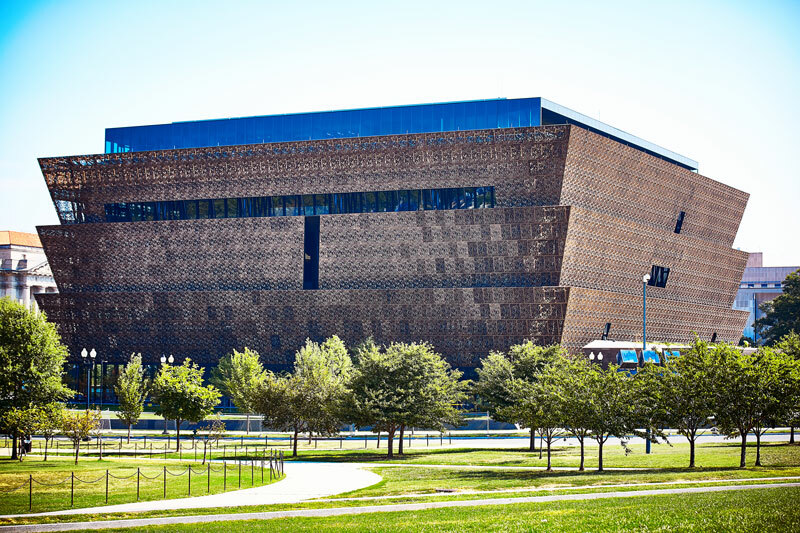 The museum is massive, but I had enough time to see an exhibition chronicling African-American history. As a viewer, you begin with the slave trade and progress chronologically towards present day. Unsurprisingly, the content was heartbreaking and uplifting and sickening and inspiring and a thousand other adjectives. It was a tour de force. And while I was familiar with the broad strokes of the major historical events, the exhibit connected centuries of discrete events into cohesive narratives, most notably ones of ongoing violence and oppression from white perpetrators and the perseverance of black people. Since the moment Africans were enslaved, they and their offspring have been victims of violence. Whippings, lynchings, police killings, and on and on. It has changed forms many times and seen many different battlefronts, but it has not stopped. There has never not been a battlefront. I was awed by the stories of bravery of black folks. I couldn’t fathom the courage of the men, women, girls, and boys who chose to flee, or march, or sit, or sue, or vote, or walk into a white school – all in the face of hatred and violence. I also couldn’t fathom the pain of the horrors that have been inflicted. I felt anger not only at the white folks who perpetrated atrocities over the last half millennium, but also at the white folks who stood by and let it happen. The emotional weight of all the violence accumulated throughout the exhibit. 400 years of history – of atrocities, of tug-of-wars between progress and violent backlashes – wore me down. 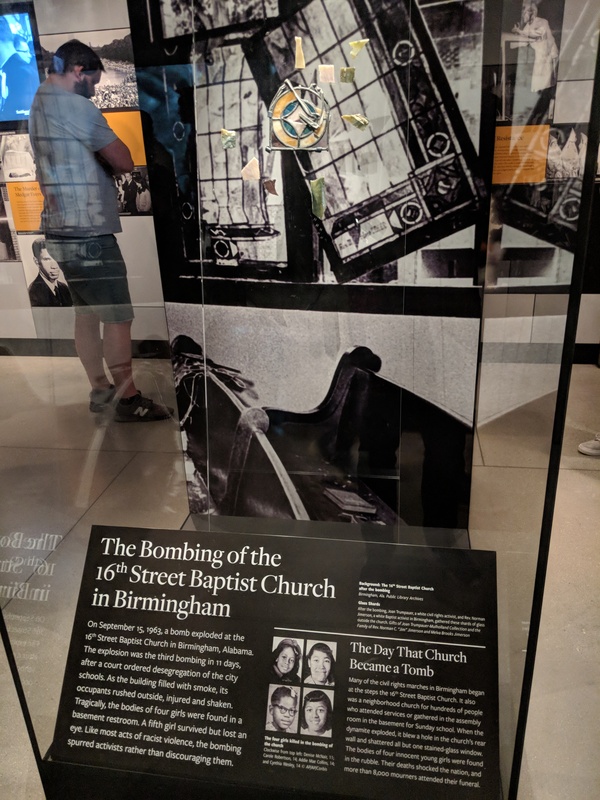 Finally, the Birmingham Church bombing broke me. 4 more innocent black girls killed. Too much senseless suffering. Too much human toll. I started crying and couldn’t stop for the rest of my time at the museum. I also recognized that the pain I felt, the emotions that were stirred – many people had (or still have) to live with all that baggage their entire lives. That’s in addition to the physical and emotional pain of being a target of such violence or being close to others who experience it. As a straight white male, I had the extraordinary privilege of choosing to experience the emotional weight – and certainly a much lighter and more sanitized version. And I knew that in a few hours, it would fade and I would be able go about my life. Rewind 3 days to the conference’s opening keynote from Chris Emdin, author of For White Folks Who Teach in the Hood. The talk was called “Towards a Revolution in STEM Education.” Over 4000 math educators attended, many of them white. It’s tough knowing where to begin to break down Dr. Emdin’s talk because it had so many layers. On the surface, the talk was a complete shift in tone, diction, pace, and energy from the series of (white) speakers who preceded him. The 30-minute talk featured rap, call-and-response, and multiple instances of Dr. Emdin jumping off the stage (to the conference organizers’ frustration) to connect with the audience. The content of the talk was packed with anecdotes, research, critiques, strategies, and more, all centering around teaching students of color. Though he didn’t explicitly say it, the quotation above seemed to undergird the entire talk. The state of education for youth of color is a corollary of the refusal to acknowledge the causes and consequences or racial stratification. Educators too commonly view math as a “neutral” discipline that defies things like race or gender, when in fact the systems, structures, and institutions that shape math class are anything but. Schooling and its components comprise a battlefront in today’s society. Dr. Emdin focused mainly on curriculum and the lack of contexts that are intuitive and familiar to students of color, but he just as easily could have talked about the countless other factors that regularly and inequitably impact students of color: student placement policies, teacher training, school funding, teaching assignments, school segregation, etc. Students of color also experience violence. Dr. Emdin showed a video of a student getting physically attacked in school, which was easy to recognize as violence. But he also showed a video of another kind of violence: a 1st grade class – full of students of color, taught by a white teacher who publicly shames a student for a counting error and sends the student off as she rips up the students’ work. Another young promising mind dehumanized and pushed away from STEM (not to mention the other emotional consequences). In other words, pedagogy can inflict violence. So can other systems, structures, and institutions, including those mentioned above. As Dr. Emdin shared this, it was clear the word “revolution” in the title of his talk was not hyperbole. He was serious. Serious, for instance, in his critique of complex reform efforts that often overlook simpler truths. A new curriculum, or set of standards, or the tech tool de jour will not improve anything if kids cannot bring their whole selves to class and feel human. He’s serious that we need to consider who our students are and the strengths they bring to school, and mine the Vibranium of our most marginalized students. Back at home now in the Bay Area, with the memories of the conference all but destined to fade, I’m left thinking about my role in all this. As was clear from the museum, too many people – white people especially – have been indifferent in the face of injustice, permitting violence to continue. The path of least resistance. Dr. Emdin provided a metaphor that felt apt: the “software updates” button that pops up on our computer, which provides users with an opt-out to kick the can down the road. Why would I update the system when the system is working fine as far as I can tell? I’ll keep listening. I was grateful for the conference speakers – not just Dr. Emdin but many others – who influenced my thinking. I’m grateful for NCTM’s choice to give these voices their due airtime. I know that there are voices at the school sites I support that I should listen to – children and adults – and I’ll only hear them if I seek them out. I’ll keep reading. Since I missed Francis Su’s talk on Mathematics for Human Flourishing, I read his amazing blog post. Dr. Emdin’s book is next in my queue. I ordered NCTM’s Rehumanizing Mathematics for Black, Indigenous, and Latinx Students. I’ll use my current role, where I have a voice in curriculum and pedagogy, to develop and spread a math program that recognizes students’ humanity, that puts basic human desires – joy, play, truth, beauty, justice, love – at its core. I’ll call out B.S. and combat problematic pedagogy when I see it. I’ll speak up and advocate for those with less access to power than me. I’ll fight the counter-productive tendencies to reduce students to the standards they don’t know and attach labels to them for not knowing them. I’ll resist my own drift towards complacency. In other words, there’s a lot of work to do, and I’ve never felt more inspired and motivated to get back to it. I also know that I don’t have all the answers, and so I am open to feedback and suggestions. More on this and NCTM coming up soon! This is a great post, thank you! I’m going to keep after you for your thoughts on this, especially if I wind up teaching. Glad you had such a great experience. Zack, this is excellent. So powerful to hear your experiences and perspectives. As a white woman, I know trying to stay conscious and figure out right-action is a lifelong challenge. As you note though, people of color don’t get to opt out, and we whites shouldn’t either. Really good writing. Zack, I appreciate your brilliant, thoughtful, heartfelt writing. With your perspectives and your conscious and examined use of your influence, you will be able to make real differences in the world. Thank you.